These flowering tobaccos (aka nicotianas) were grown from seed saved from last year. Petunias, including two full hanging baskets that I bought for a buck each from Lowes in late August. Mallows, all self-sown. Some look like ‘Zebrina’ and some look like M. sylvestris. Several colors of Phlox paniculata, all winding down. It seems to me I usually have more kinds of colchicums blooming by now, but I haven’t checked my records to see if this perception is correct. These particular larkspur plants were nibbled down by a rabbit earlier in the season, and so are only now coming into their own. In general the nights were cool all summer long, which kept them blooming, I think. 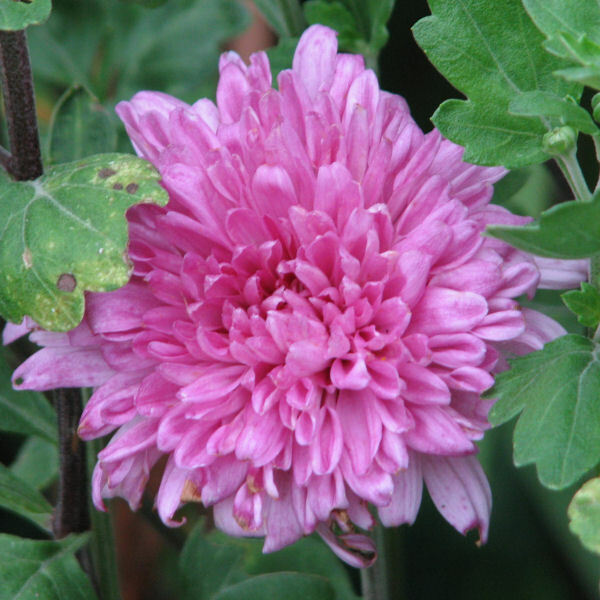 The last rose and the first chrysanthemums are blooming within a foot of each other. I’m not sure the colors go so well, but I’m looking the other way. 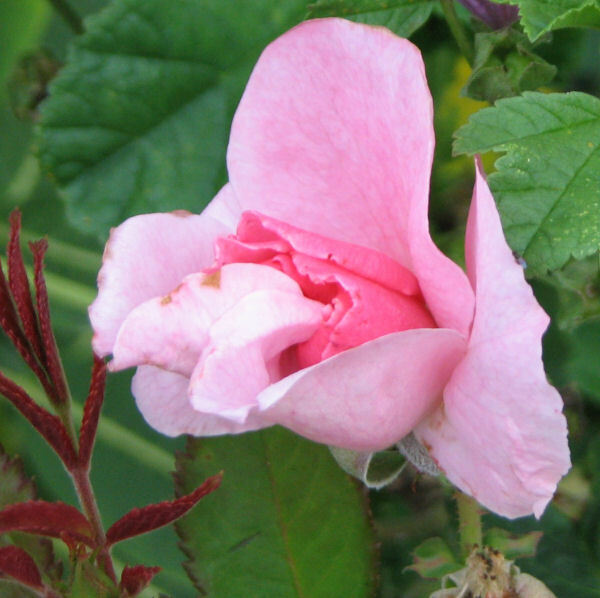 Last year was the rose’s first year in my garden, and it was finished blooming by the time the mum had started. Tunic flower and catmint are both still blooming, the catmint sparsely. And what’s up with this? My globeflowers didn’t bloom this spring. They started blooming in early August and they’re still going at it. I’ve never seen this before, have you? And those words I’ve been dreading showed up on Weather Underground: Patchy frost after midnight tonight. Sigh . . .
Stop by at May Dreams Garden for all the other Bloom Day reports. 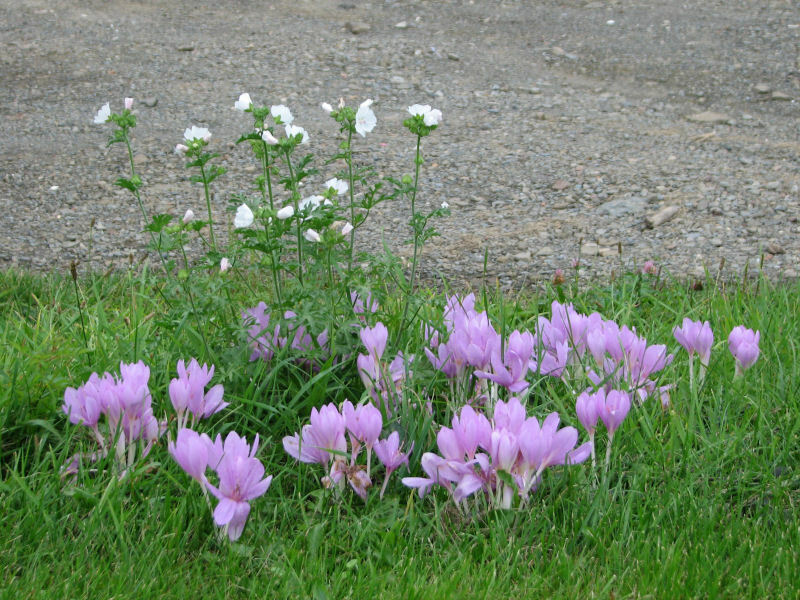 This month’s American Gardener shows colchicum pronounced pretty much the way I said. They sound out the first syllable as “coal” versus my “cull” but if I wasn’t mumbling that’s probably how mine would sound, too. Miss L also notes that saying “col-chick-um” is accepted in America. That’s the way I’d been saying it, but once I read this story the hard ‘k’ stuck in my mind. wonderful pics, I enjoyed reading about your flowers. Don’t know much about globeflowers, but ? a nice surprise. Robin, asters come in all different sizes. Since they are fall blooming plants, I’d plant them in the spring. 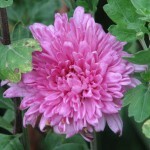 I lost my cultivated ones in a dry year, so I currently only have self-sown ones here. As I’m sure you know, they are native plants, and so common around here they are regarded as weeds. One day I’m going to replace the Alma Potchke that I lost due to never dividing it. (At least, I think that’s why I lost it.) That had an amazing hot pink to magenta color that the local asters don’t have. That larkspur is an amazing color. Frost is a good thing – no more mosquitos & autumn leaf color. I didn’t realize that asters got that tall. I planted several last fall for the first time and none of them came back. I would have definitely had to move them had they lived. It’s too soon to start talking about frosts. I hope your things survive it so you can enjoy them a little longer. We had a frost advisory in effect last night, and I covered some of the still-producing tomatoes but everything came through just fine anyway. It’s supposed to be a bit warmer tonight… low 40s instead of the high 30s. Yikes. Those trollius are pretty, even if they are blooming at the “wrong” time. It seems like lots of spring bloomers were confused by our late snow–around here lots of the magnolias are reblooming sparsely. What are “tunic flowers,” by the way? I’m not familiar with that common name. All: credit for the nicotianas must go to my daughter, who saved the seed from last year, started it indoors this year, and babied them along until it was time to plant. The only thing I did was say “yes” when she asked to plant her spares there. She is chief vegetable gardener and plants most of her flowers there where she can enjoy them while tending the veggies. It “only” got down to 38F (3C) last night but we have a frost advisory in effect for tonight as well. And then we’re off the hook for the forseeable future (which is subject to change at any moment). Kathy, I’d think it was spring in your garden with that larkspur just now blooming, but your asters tell a different tale. They look beautiful against that rustic chicken-wire fence. And I like your pinks together, by the way. I think we’d better get used to hearing “patchy frost”, it’s going to happen probably sooner than later. My asters are almost played out. They seem to bloom in mid-summer here rather than fall, probably due to their location. 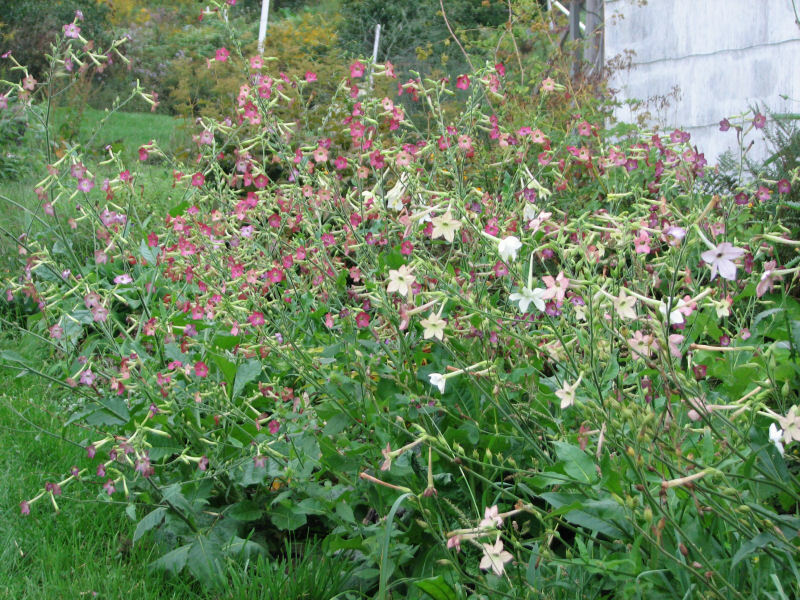 Your nicotiana are looking fabulous and their willingness to bloom till frost is one of the reasons I love them. Very nice Bloom Day you have going! 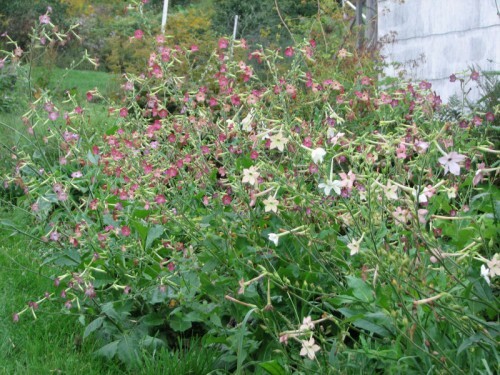 Your lovely nicotiana reminds me that I’ve wanted to try it for some time now. Seeing yours makes me more motivated than ever. 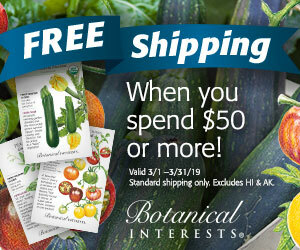 Kathy, You reminded me that I forgot to include the nicotianas! I planted the lime green and burgundy ones and really love all of them! Frost? Say it isn’t so! It is pretty chilly here also but no frost yet! Annie, I must have missed that Elizabeth Lawrence story. I pronounce it CULL-chick-ums, near as I can relate it. And I have no idea if it’s correct. I don’t know if I’ve ever heard anyone pronounce it that didn’t learn the pronunciation from me. Blind leading the blind. And Carol, that possible frost is about a week earlier than I had hoped, and my reaction is the same as yours. Too soon! But it ain’t a done deal. We will cover everything, because it is supposed to warm up after this, and since they now think we will have cloud cover, it may not happen. But it’s too close not to take precautions. 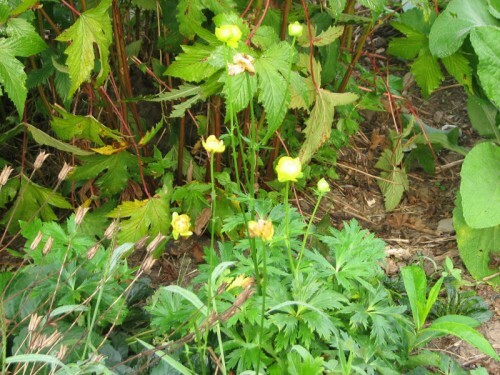 It’s been years since I saw a globeflower, Kathy – used to be a favorite. 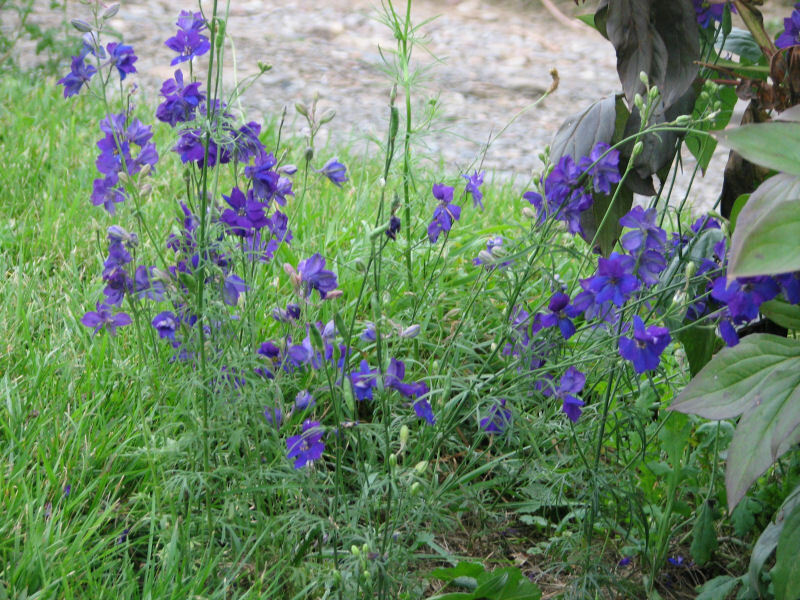 Your larkspur and asters look wonderful. My asters don’t have buds yet and unlike everything that grows at Zanthan Gardens, their bloom-dates were never recorded from previous years. I’ll just be surprised when they’re in flower. When speaking of your Colchicums do you use the CH pronunciation or the CK one? Whenever I see the word in print I think of Elizabeth Lawrence’s story about that. 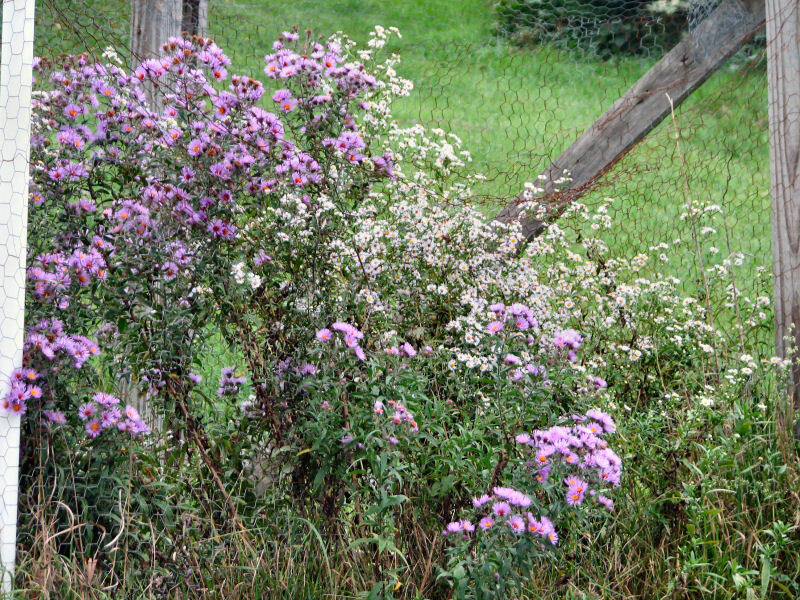 Let’s see… your asters are in their glory now and mine have just barely started to flower. That puts me about two weeks behind you. So if you have a patchy frost warning now, does that mean I’ll have one in two weeks? Noooooooo! I need more time! 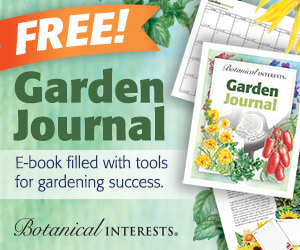 Thanks for participating in Garden Bloggers’ Bloom Day!